Human Rights Activist News Agency (HRANA) – Mohammad Ali (Pirouz) Mansouri, who has been a political prisoner at Rajai Shahr for eleven years, is further from freedom than he thought. A new case file opened up against Mansouri, accusing him of “gathering and conspiring against the regime,” will prolong his 15-year prison sentence by another five years. Cited in court as evidence of this charge were records of his hunger strikes, instances of “aggravating other prisoners,” his declaration of support for Mohammad Ali Taheri, and a statement he issued condemning the execution of a Sunni prisoner. 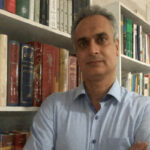 In an effort to alert human rights defenders — particularly the UN’s Special Rapporteur on Human Rights in Iran — Mansouri has written an open letter detailing the circumstances of the new case file. I, Mohammad Ali Mansouri, have been serving a prison sentence since August 28, 2007 — i.e. for eleven years. In May of 2017, per a newly fabricated case file, I was imprisoned and interrogated in Ward 209 [Ministry of Intelligence jurisdiction] for a month. The new charge was built on my exchanges through [the messenger app] Telegram. Since I’ve been in prison, I haven’t been granted a single day of furlough. In the absence of any evidence, charges were dismissed, and the case was closed. Then, in October, I was interrogated once more, in connection to a new charge: propaganda against the regime. From behind bars. In January, without any advance notice that would allow me to retain an attorney, I was tried by Judge Moghiseh in Branch 28 of the Tehran Revolutionary Court. I was indicted on charges that were never mentioned during my interrogations. The trial was unconventional[…]even compared to the unlawful methods employed routinely. Defenseless and without the presence of an attorney, I was sentenced to five years of imprisonment for propaganda against the regime and gathering and conspiring with intent to commit a crime. The sentence was issued without a supervising judge, without me, and in the sole presence of the court secretary. The court record was entirely verbal. It was in no way compliant with the Islamic Penal Code. It was never clarified how it was deemed feasible when a hearing never convened, a judge never appeared, the defendant was absent, and the defense itself never spoke, that an appeal request could be filed and that this file could result in a sentence? I write not for the people of my country, who know this story by their own flesh and bones, but for human rights organizations, especially the United Nations Special Rapporteur on Human Rights in Iran. May they see the real face of our so-called independent judiciary, which is nothing but a sentence-printing machine run by the Ministry of Intelligence. Mohammad Ali (Pirouz) Mansouri was arrested September 2007 for participating in the 19th-anniversary commemorations of political prisoners that were executed in 1986. Branch 15 of Tehran Revolutionary Court, presided by Judge Salavati, sentenced him to 17 years of imprisonment on charges of “contacting and conspiring with the anti-regime Mujahedin-e Khalq Organization”. Added to that was an exile sentence to Karaj, in Rajai Shahr Prison, and a fine of 150 thousand tomans [approximately $80 USD]. The sentence was upheld in appeals court. In July 2015, Mansouri’s daughter Iran Mansouri reported that a clemency program held on a religious holiday had reduced her father’s sentence by two years. His most recent case file has increased his remaining five-year term to a decade. He has yet to be granted furlough. 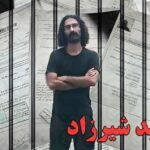 Human Rights Activists News Agency (HRANA) – Rajai Shahr political prisoner Saeed Shirzad will remain in prison through 2020, according to HRANA reports. 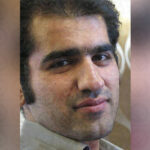 His most recent convictions stem from a prison protest that broke out last August among a group of wardmates, including Shirzad, who protested their transfer to an enhanced-security ward under the jurisdiction of Iran’s security establishment. For Shirzad and his fellow prisoners Amir Ghaziani, Saeed Pourheidar, and Ebrahim Firoozi, the protests incurred charges of “destruction of prison property,” ruled in January of 2018 in in Tehran province’s Criminal Court No. 2, Branch 116. Rather than add prison time for the latter charge, Branch 3 of the Evin Prison Prosecutor’s Office set them a bail of 700 million IRR (approximately $7,000 USD). The “disturbing public order” sentence, along with the enactment of a one-year suspended sentence pursuant to a 2012 arrest, will compound Shirzad’s current five-year sentence by an additional year, slating his release for 2020. According to HRANA reports, Shirzad’s five-year sentence was ruled on charges of “assembling and colluding against national security,” in connection to civic activities including visits to the families of political prisoners. [Though he began serving this sentence four years ago, it was not finalized until 2017]. Since his arrest in the Tabriz refinery where he worked on June 2nd, 2014, Shirzad’s prison time has been fraught with both oppression and physical pain. On July 11th, 2018, HRANA reported on prison authorities’ refusal to comply with medical orders for more specialized treatment of Shirzad’s lumbar disc disease and spastic lower back inflammation. As authorities continued to reject his requests for the recommended medical transfer — even out of Shirzad’s own pocket — his condition has deteriorated, and he now relies on a walker. HRANA also covered Shirzad’s gestures of protest against his condition and treatment in the system, including hunger strike and sewing his mouth shut. Due to multiple postponements of his court date, he was also subject to a judicial lag of 15 months between his June 2014 arrest and September 2015 trial in Tehran Revolutionary Court Branch 15, presided by Judge Salavati. 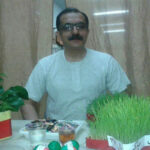 During that period he was detained without a conviction first in Evin, and then in Rajai Shahr Prison. On April 15th, 2017 — a year and half after his already-delayed initial trial — his appeals session convened in Branch 54 of Tehran Appeals Court and ultimately ruled to uphold his 5-year prison sentence. Shirzad’s rap sheet with authorities dates back to August 21, 2012, when he was arrested and given his one-year suspended sentence for assisting earthquake victims in Ahar, East Azerbaijan province, where he was reportedly involved in the operations of Sarand-based rescue camps. Though he was released on bail 19 days later, his more recent offenses — viewed as a kind of parole violation in the judicial system — kicked the suspended sentence into effect. 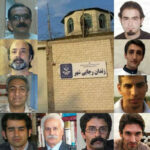 Rajai Shahr Prison, where Shirzad is currently held, is located in the northwestern Tehran suburb of Karaj. 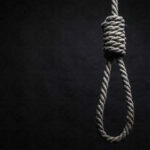 Human Rights Activists News Agency (HRANA)- Early in the morning of October 3, 2018, at least three prisoners were hanged to death while seven others were granted temporary reprieve. HRANA has confirmed the identities of those executed as Yasser Eslami and Mahmoud Akbari of Ward 1 and Omid Khosronejad of Ward 10. 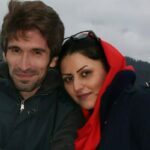 Eslami and Khosronejad, co-defendants in a murder case, spent four years in prison prior to their executions yesterday. 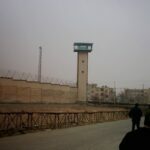 Mehdi Danesh from Ward 1 and Siroos Khodabandehlou from Ward 6 were among the seven prisoners whose execution was stayed. HRANA previously reported on a mass transfer of prisoners to solitary confinement, the protocol for prisoners whose execution is imminent. 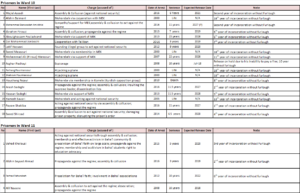 All ten of the above prisoners were transferred to solitary cells on Sunday, September 30th. By carrying out these hangings in silence, authorities — particularly the judiciary — demonstrate a continued pattern of obfuscation on the topic of prisoner sentencing and executions, in spite of their responsibilities of informing the public. 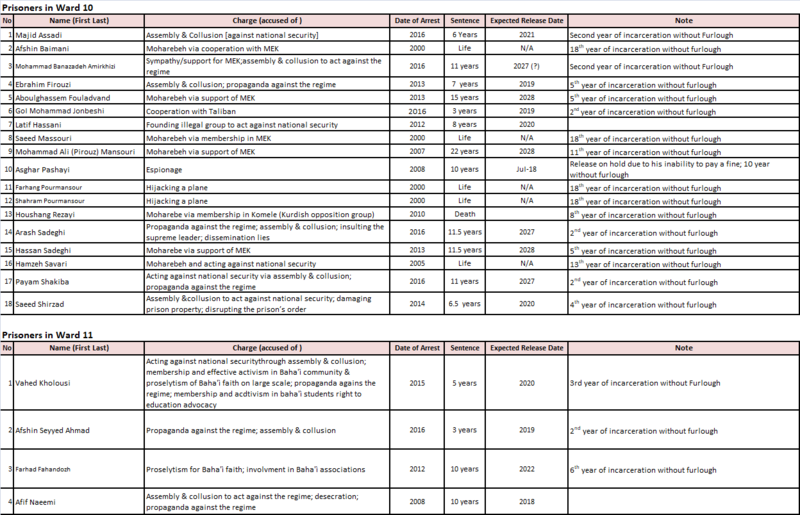 According to registered data from 2,945 reports by the Statistics, Publications, and Achievements Division of HRAI, in the past year (from March 21, 2017, to March 18, 2018) at least 322 citizens were executed and 236 others were sentenced to death in Iran. Among these were the executions of four juvenile offenders and 23 public hangings. 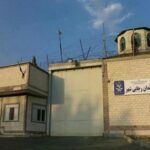 HRANA News Agency – The political prisoners in Rajai Shahr prison in Karaj who were forced to move to the security halls earlier in August, have faced double problems such as denial of proper nutrition, lack of hot water for bathing and defective heating systems along with the arrival of the cold season. Prison authorities have suggested to them to forget their rights such as principle of separation of crimes in order to have basic facilities.